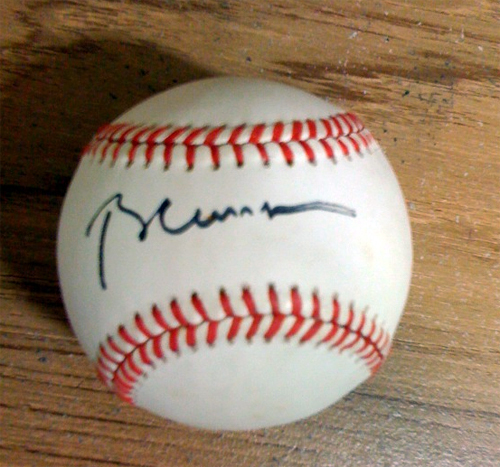 This would be a baseball signed by President Bill Clinton, who made some news recently with his trip to North Korea (and the two imprisoned journalists who got to come home as a result). Something I find to be especially significant about this item is that Clinton is genuinely a huge baseball fan: not just the game itself, but within the context of American history as well. Harold Reynolds conducted an insightful interview with him earlier in the year, you can click here to check out a segment if you missed it. Our last three Presidents, Clinton, Bush and Obama, are on some very different wavelengths where politics and policies are concerned. As an American, I find it somewhat comforting that they all appreciate baseball, and do so in different ways as well. Clinton grew up a Cardinals fan and had a deep admiration for Jackie Robinson, Willie Mays and Hank Aaron. George W. Bush famously owned a part of the Texas Rangers prior to his political career. And of course, Obama is well known for his support of the South Side’s White Sox; he doesn’t play politics there, as you won’t see him wearing a Cubs hat anytime soon. So while America is a country with people who have the inherent right to voice strong opinions on major issues, it’s nice to know sports can serve the purpose of a constant narrative, one that everyone can enjoy and appreciate. Especially today, when even the Washington Nationals got a glimmer of hope.